No, we didn’t hit a time warp. And no, you aren’t just waking up from a rum-induced fog caused by fruitcake vapors. It really is FRIDAY! If you’re like me, and spent most of yesterday thinking it was Monday, this probably comes as a bit of a shock. Rest assured, being a journalist, I have verified this development through rigorous research and the help of my local Starbuck’s, where I was told it is Frappe’ Friday. That means in addition to saving .50 cents on a $9 coffee drink whose name sounds like a kitten getting sick, it’s also time for Ned’s Nickel’s Worth on Writing — or my NWOW for short. Not that my NWOW has ever been called short. At least in terms of word count. I don’t know what that means exactly, but hey: Tom CLANCY said it! And that’s good enough for me. Ok, maybe that last one was just me. Regardless, I think we can all agree resolutions are a great way to jump-start goals for personal improvement and life changes. At least until the end of February, at which point we often “re-evaluate” our goals and make “more realistic” adjustments to those goals by “dropping them completely.” For this reason, as writers, we need to be careful about the resolutions we make regarding literary goals, and in some cases we shouldn’t make them at all. Oops, sorry — That was me speaking in third-person again. Still, I think it raises a good point: I’m fortunate enough to write full-time for a newspaper, so who am I to tell you not to set lofty goals for yourself when I’m living the dream my editor coincidentally calls her nightmare? All I can say is that I’m the guy without a college education who spent 10 years cooking in kitchens before being mistakenly hired enthusiastically added to the editorial staff here at Siuslaw News 15 years ago. I can tell you from experience that reaching this level of success, which includes not two but three readers from Florida who are willing to admit they follow this blog, only came after making several important realizations — and failures — regarding New Year’s resolutions and goal setting for my writing. What I came to realize after several attempts to “start and complete that novel” was that the mere fact I was waiting for a start date doomed me to failure. I can honestly say the best things that have happened to me in my life — including meeting my wife on Match.com, getting this job, actually starting and finishing a mystery novel years ago — didn’t come by way of setting goals; they came from acting on them instinctively and following through, regardless of the date. 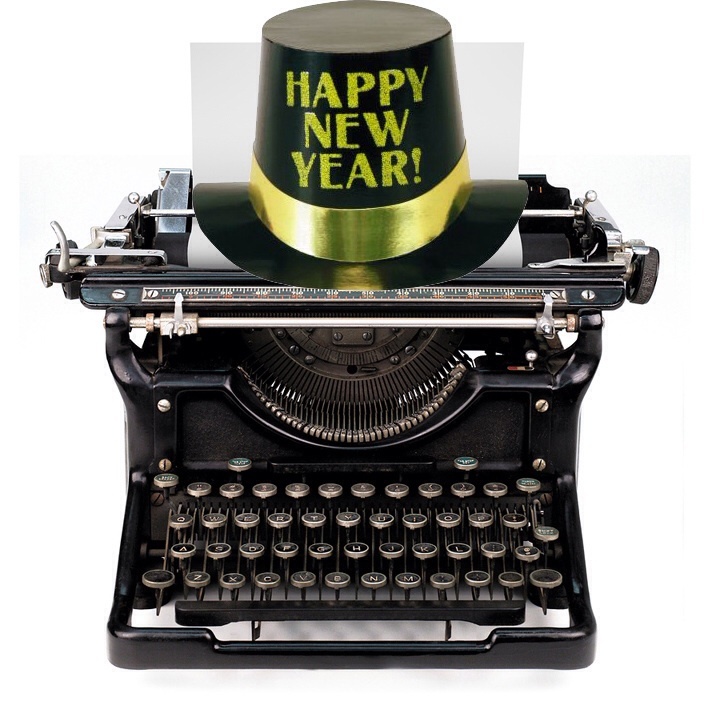 The decision to start pursuing your goals as a writer — whether it’s to start a blog or publish a blockbuster — shouldn’t hinge on the New Year. The only exception might be writing for a calendar company. What does this mean? Clearly, writers who set resolutions for themselves should be “singularly focused” and should not simultaneously diet, even if they have a pear-shaped body. In short, keep your resolution exactly that: singular. That way you can give it your complete focus and not be distracted by the success or failure of other goals you promised yourself. My intention isn’t to dissuade anyone from pursuing resolutions into the New Year, or setting lofty goals for themselves. Though I had my share a failures with resolutions over the years when it came to my writing, I don’t regret them. Thank you for being so inspirational Ned…this post alone proves you don’t have to have any idea what you’re doing, why, or even what you’re talking about to record mental ramblings. Well done, sir! Purely coincidental, I assure you. Always irritated the hell out of the 17th person! Whatever you just said, I’m hungry now— thanks! Can’t wait! I can think of few things more noble then that. And once you’re done, would you mind seeing what you can do about getting Temptation Island back? Ned I am absolutely against goals of any sort. Do you know what all the goals you write down on Jan 1rst 2014 are. They will most likely be a written record of your failure as a human being on Jan 1rst 2015. It will be a list of all the thinks you couldnt do. that is just a hell of a way to go into the new year. Goals are for suckers. for further explanation i refer you to a diagram i made years ago i think it applies to being happy. I hear you, Tom! And thanks for the highly effective graphic, which clearly illustrates the ratio of expectation to happiness, as well as dramatic color usage. Well done! Sounds like you’ve learned something over the years, Ned. It’s been lovely to connect to you, and I hope 2014 is your best one yet. Thanks so much, Eden — and the feeling is very mutual. I can not even express my gratitude towards you right now, because I’ve been having the crappiest day. I love how within rambles you’re constructed a humorous, entertaining, and helpful blog post. At first I thought it was going to focus on plain sarcasm, but turns out you know what you’re talking about. 3) buy flowers for the neighbors and then BURN THEM. Happy holidays, and a happy new year to you! I’m so glad I could help brighten an otherwise crappy day; it’s usually the other way around. By the way, your resolutions sound very realistic, although I am confused on the last one: will you be burning the flowers or the neighbors? And of course, any time. Make your new year’s resolutions in July. I mean, it’s the only way to make sure that you’re not just hopping on the feel-good bandwagon that will crash at the bottom of the hill come February. You know, like the wagon that Calvin and Hobbes are always crashing. Be a better person in July, not now, not when everyone else is trying to do the same exact thing. That’s right! Beat the holiday rush! If we wrote the resolutions at the end of the year, we’d have a better success rate. I’m trying to decide which I’ve enjoyed more…the post or the responses! I may have some neighbors to burn (JK-geesh!) and I dream about bacon. Your friends are cool! The fact that I hadn’t read your NWOW didn’t pop unto my head until tonight. Once I realized I could have missed it, panic ensued and my family will not be getting supper until I have read it thoroughly. And YES, I do have a point. I sat down this afternoon to the new Scrivener application on my desk top to write “the novel.” It would have happened sooner, but my gaming teenager has been so busy slaying zombies and minecrafting, that I’ve been unable to gain access. Ironically, I almost stopped because it wasn’t JANUARY 1. How gratifying to read your post and “get permission” to move forward. The goal(s) isn’t(aren’t) official or written down (yet), but I’m definitely doing something more with this whole writing thing in 2014. I don’t plan to miss any more of your Friday posts…Starbuck’s is on me! Anyway, I’m glad you plan to “do more with this writing thing” in the new year 😉 It would be a shame if you didn’t. And if I’m ever out your way, I’ll make it in December so you can treat me to a Starbuck’s salted carmel mocha. My only writing strategy is to write, write, and write some more. Eventually, something good is gonna come out of it. I used the same strategy for running, and went from an out of shape asthmatic to a fit half-marathoner. Whew! Glad it wasn’t my writing. Although it wouldn’t have been the first time. And I’m not just talking about people leaving Florida.